An underwater communication protocol that opens the way for a standardised "Internet of Underwater Things" has been developed by the NATO Science and Technology Organisation Centre for Maritime Research & Experimentation (CMRE) in La Spezia, Italy. The protocol, called JANUS, is now recognised as a standard, called a STANAG for Standardisation Agreement, by all NATO nations, making it the first ever digital underwater communication protocol that has been recognised at the international level. JANUS will enable networks of unmanned systems from different manufacturers to communicate and exchange data with one another more easily. Ten years ago, the CMRE started developing a digital underwater coding standard aimed at providing a baseline common denominator for underwater acoustic communications. The protocol is a way of encoding information into sound simple enough that existing and new equipment can be brought into compliance with the standard relatively easily. It is named after JANUS, the Roman God of openings and gateways, because it opens the portal between different operating paradigms. In practice, the CMRE says JANUS works like a “lingua franca,” and can make military and civilian, NATO and non-NATO devices for anti-submarine warfare (ASW), anti-mine warfare, maritime security and search and rescue, fully interoperable. As happened with the Wi-Fi protocol above the water, JANUS has the potential to leverage technological investments and create a lot more value under the water, making all compliant assets (and networks of those) able to cooperate with a robust signalling method. Progress in unmanned vehicles, robotics and sensor networks can be applied to deliver new capabilities that were impossible before, or to do traditional missions in ways that are less expensive and less risky,” says Alessandro Berni, head of information laboratories at the CMRE. Adopted globally, JANUS is aimed at stopping the current underwater “Tower of Babel” between modems and systems of different manufacturers and nations. For that reason the JANUS development process has been, since the beginning, as inclusive as possible, involving academia, industry and governmental agencies. Tests of JANUS at sea have been conducted by CMRE on board the NATO Research Vessel Alliance, and using the innovative CMRE Littoral Ocean Observatory Network (LOON), which facilitates experimentation of marine robots’ mission-base teams by creating a monitoring acoustic network with tripods of underwater communications equipment sitting on the seabed, but accessible by users across the world via web. 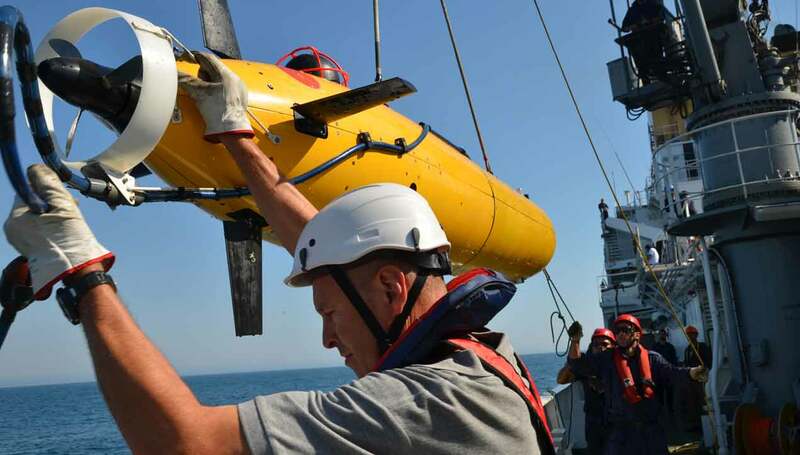 Ryan Goldhahn, a scientist in the research department at CMRE, says the centre researched ASW using a network of autonomous platforms, autonomous underwater vehicles and autonomous surface vehicles.